Browse our large variety of industrial rated CAT Pressure Washer Pumps. Built in Japan, CAT PUMPS started in 1968, and has become one of the world leaders of industrial, reciprocating, high-pressure, triplex plunger pumps. 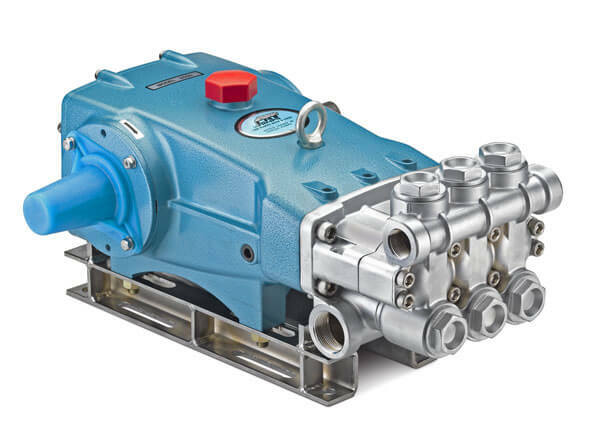 The high quality components, exceptionally long lasting seals and field-proven dependability have made them the pump of choice where continuous-duty performance and low-maintenance are priorities. Cat Pumps are energy- efficient and committed to provide a dependable pressure washer pump. Read more about CAT Pumps. Triplex plunger design provides smooth liquid flow. Formulated high pressure seals and ground ceramic plungers assure maximum seal life. Compact design for maximum portability. 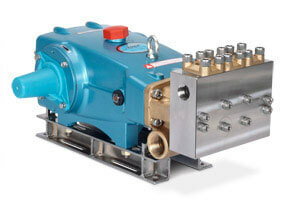 Built-in modular regulating unloader and bypass to assure system pressure control and pump protection. Don't forget to get some extra pump oil. 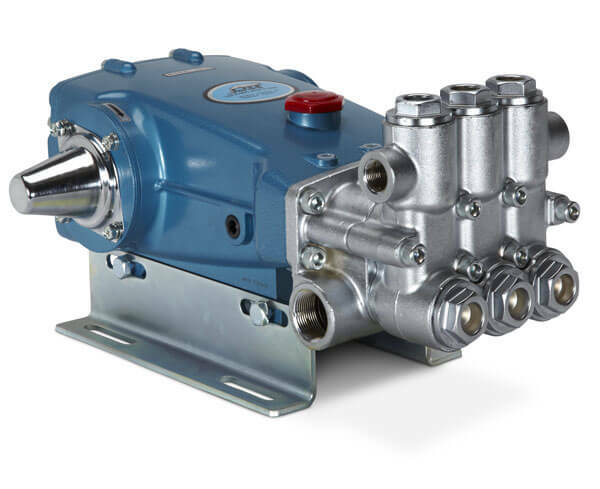 The 2DX and 3DX Series pumps are affordable, and compact. These pressure pumps are Direct-drive Plunger Pumps made for lightweight Pressure Washers. Low-maintenance, easy-to-service stacked SS valves. Triplex plunger design gives smooth liquid flow. Large oil bath crankcase assures optimum lubrication. Ground ceramic plungers assure maximum seal life. Oversized crankshaft bearings with greater load capacity creating longer bearing life. The 5CP Series is an extended-duty Belt-Drive Plunger Pump made for a gas or electric power washer. Triplex plunger design provides smooth liquid flow. Formulated high pressure seals and ground ceramic plungers assure maximum seal life. 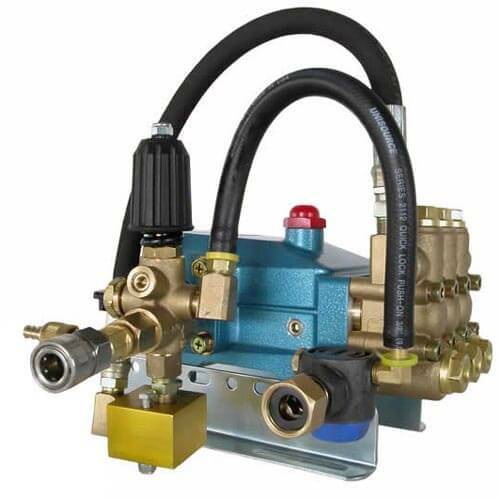 These are our most popular high-pressure pumps for Gas Pressure Washers. 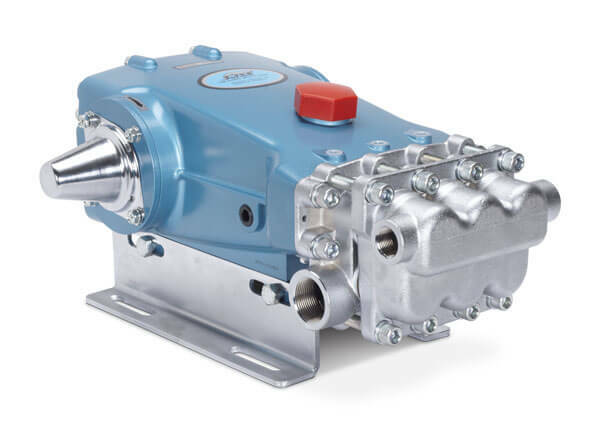 The 66DX Series Direct-Drive Plunger Pumps come standard with Modular Unloader and Fixed Chemical Injector. The industrial line of CAT pumps are designed for high flow (GPM) applications. They are known as the most reliable pump in the industry and are trusted for durability and longevity. Belt driven for slower turn speeds and longer life span. 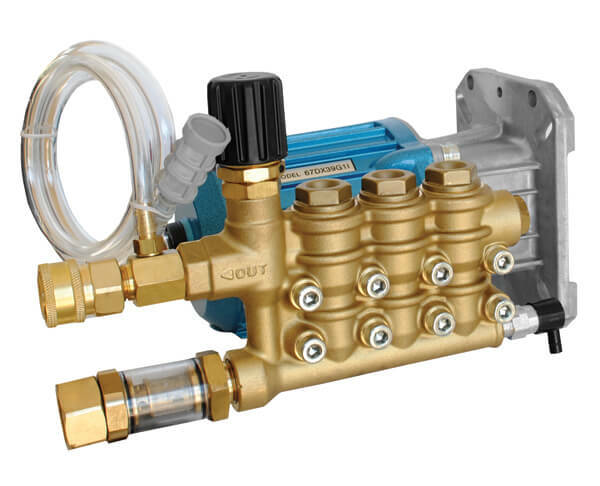 Some models have nickel plate or stainless steel manifolds for extra corrosion resistance. Cat pressure washer pump has a wonderful reputation for providing and maintaining high quality pumps for pressure washing. 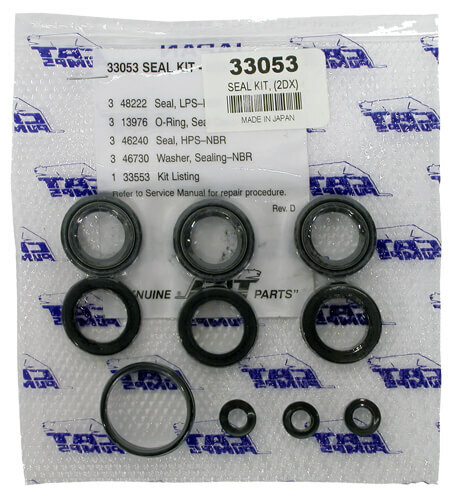 Please check out our extensive line of Cat Pump repair kits and accessories. 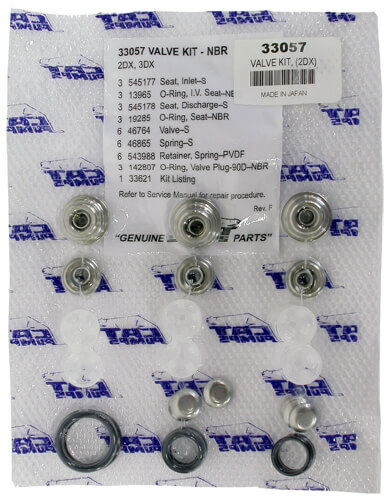 Use the repair chart below to find the correct part you need and pricing is below. If you do not see the product you need below please call for price and availability. If you are not sure on the part you need for your CAT pressure washer pump, please refer to the CAT breakdown diagrams located near each pump. If you still need further support, please send us an e-mail to info@ultimatewasher.com with your CAT model number and the part that you need. A CAT pressure washer pump is a great selection when you’re performing maintenance on your pressure washer. These high pressure pumps come in a variety of models that can handle the toughest jobs and locations you can dish out. As a business owner you’ll want to select the part that is the most dependable and these parts deliver the goods in that department. CAT pressure washer pumps are ideal for medium to heavy duty applications since they have pumps that can handle flow rates from 2 to 4 gallons per minute. Their specially formulated seals and ceramic plungers allow these pumps to handle the rigors of everyday use while still lasting years instead of months. They’re an ideal choice if you’re looking to replace or upgrade the pump unit on your pressure washer. The 2DX, 3DX, 2F CAT pressure washer pumps features power options that range from 2 to 6.5 HP while handling pressure ratings of 2000 and 2500 psi. Their triplex plunger design provides smooth flow for liquids at 2 to 2.7 gallons per minute. The design also helps cut down on cavitation which is extremely harmful to any type of pump. 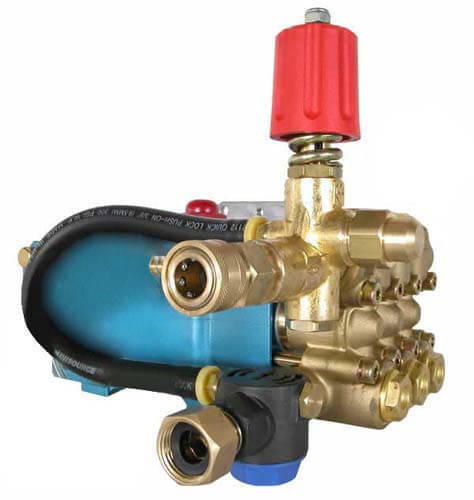 They also feature an internal regulating system that assists in pressure control and helps protect the pump. Their power and dependability makes them the ideal choice for light to medium duty applications such as cleaning and stripping of finishes. For heavy duty use you may want to take a look at the 66DX and 5CP series CAT pressure washer pumps. These units boast 11 to 13 HP gas powered engines that can produce 3000 to 4500 psi and handle flow rates of 3.5 to 4.5 gallons per minute. The pumps are built for repeated use under strenuous conditions thanks to oversized crankshaft bearings and large oil bath casing. They’re also remarkably smooth in use operating which is impressive given their power capacities. When choosing a pump for your pressure washer you want to make sure it can handle the workload you’re going to dish out. The last thing you want to do is invest in a new pump only for it to be the wrong size and underperform. These pumps can handle any sized project from root cutting to stripping paint to cleaning patios. A new CAT pressure water pump will make your pressure washing unit operate like the day you first purchased it.